I dont recommend anyone to call this storage if you were to call them itll keep saying all day that the line was busy. As of july 21st my due date is overdue and it seems like the more longer i wait the harder it is for me to pay my bills. Very friendly staff. I had a young lady named Mayra help me through the process. Made everything easy. Very Friendly enviroment and facility looks clean. Great Team Gabriel!! I had a good exp with this location especially Myra V. she was very helpful, knowledgeable, and fast. She treated me kindly and respectful. Glad I found this place . I will definitely recommend this place to my friends and family. Awful customer service. I called in to ask a question, I selected to be transfer to the spanish line. When the lady picked up, for whatever reason, she transferred me to an english one. I asked to be transferred to the spanish line again as I don't even know why she did that. After being transferred back, I talked with the spanish lady again. I asked her my question, but she actually said she doesn't know. What kind of answer is that. Worst of all, she hanged up on me. I tried again, after 5 minutes of waiting, she picked up the phone. This time she straight up hanged up. My mother and I have both rented storage from them. I have never had any problems with employees and are always friendly. 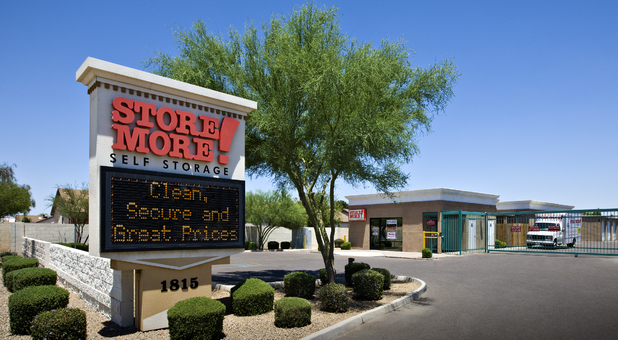 We had a very good experience with Store More self storage. Teresa @ the front desk was very helpful and knowledgeable. I did not have to wait for a long time even though attendant Teresa was busy helping out another customer. Was nice enough to acknowledge us and make sure we felt welcomed. Would recommend storage rental from this facility. Store More Self Storage is GREAT especially Teresa, She was working all by herself and was great helping every one out in an efficient matter and time. Would so recommend getting a Storage and or U-Haul truck with her. A big thank to the staff at store more In our ever change economy, the staff here help and honoring price matching our unit. Thank you from old times here at store More.... . Need storage this is the place to go, had the best experience ever!! Steven was awsome. He was very friendly and made me feel safe storing my goods here. The price was good aswell. great staff :) they took very good care of me :) the property manager (teresa) very friendly she gave me a great DEAL! i would recomend this place to anyone looking for a storage unit! BEst prices in area! Not many write a review when they leave, but I thought it was important given the fact that our experience was always positive from the beginning all the way to the end. Over the years Nick and Paul have been very helpful and caring. We left because we have moved into a bigger place that can house the rest of our stuff. Nick was kind enough to give us late night access to accommodate our schedule. Thanks for the great service. I Have been with them for 2 years,all the staff is great ..nick angulo is also always very helpful and is a great employee,also smells and looks great...very happy here and would recomend this company to friends and family. For my first time renting a storage unit, I had great service and zero problems of any kind. If in the near future that I have to rent a storage space, I will contact and use Store More! without hesitation. Nick and Paul were very helpful. i was hesitant about a previous experience from coming here a couple of years ago. but to my surprise there were new people who had great customer service skill and very reassuring with their helpfulness. The up-front service was awesome, Nick Karen and Paul were very helpful and made sure I got what I needed and nothing more. I would for sure rent here again! Nick Angulo was such an amazing help!! I had a hard time with the website trying to get registered so I can pay online, he was so patient and walk me through every step! Not to mention my experience renting here.. the crew is always so helpful and with great ethics and attitudes.. Came to this place for their safe location. Nick was great! Made this fast and easy for me. I initially was not planning on using storage, but when you need it, you just need it. The office staff was awesome. They were kind, and helpful. Great customer service! The service that I've gotten at store more has been exceptional. Nick has been very helpful and has given me all the information I need. He also has answered all my questions. I am happy with the service. Great customer service! Perfect unit and was a perfect deal for us! Definately using store more self storage again! Thanks! This is a great place to store my belongings. Been there over 3 years and never had a problem. Thanks Store More. Spoke with Paul. Go Visit Nick and Paul. They understand the importance of great customer service. These units are clean, safe, secure, and affordable. We live 40 minutes away but choose to stay because of the great service we have received over the last year. Thanks again Paul and Nick! Just rented a unit at the phx. location and I know that moving is a headache and sometimes we don't go in with a good attitude. The staff was patient, understanding, helpful and very attentive. They went out of there way to help me and made my move so much easier from the lock on the door to the truck rental. Thanks a bunch!!! Sincerely , "A Satisfied Customer"
The two women in your office were so pleasant and welcoming. We were shown the actual sizes of the units we were considering. Received a great price for our unit and would recommend them to anyone looking for a unit. Thanks again Ladies!!! I have had my unit her for awhile now and is very impressed with the new management staff that they have in placed. the 2 males are very helpful and to top it off handsome as hell. I have had a unit for almost two years. This was the second time I rented at this location and I would again. The facility has always been clean, easily accessible, and the staff incredibly nice. I would recommend this location to anyone looking for a safe place to store there belongings. Best storage facility along with #1 customer service and satisfaction. Thanks Jennifer! Thank you so much Jennifer at Store More. You have gone above and beyond to help us out with our storage unit. With your friendliness and great attitude we will always consider using you guys in the near future.. Choosing a storage unit isn't easy but you made us feel comfortable and happy to store our stuff with you guys. So again, THANK YOU so much for everything... German..
Great location with Great management team!! My son needed a storage unit with not much notice. We went down to the 91st ave and McDowell location and the customer service we received was awesome. The faciility is very clean and he was given a unit that fit his needs perfectly. I would recommend anyone needing a storage unit to come here. Hi Store More Phoenix, Has great customer Service Schaun the manager goes over and beyond to keep you happy. Over all service is Great..
all the staff is very attentive and cordial thanks guys . little dirty pot inside. StoreMore Phoenix was very helpful when my father passed and I had to access his unit. They are both professional and very understanding people. Thank you! I've been a customer here at Store More for a little over 7 years and I must say, we've been a satisfied customer ever since. The staff is professional, courteous and helpful. I would recommend Store More to any of my family & friends. I enjoy storing my car at store more because I feel safe knowing that I don't have to worry about thieves. they are very friendly people persons. thanks store more! The staff is very professional and helpul. I appreciate the alarm set up that comes with the storage unit. I would definitely recommend them for your storage needs. I have stored at this site for over a year and have had no issues. I've even pulled a lot of stuff I need out of storage recently and haven't had to deal with any pests or bugs even though I had an outside unit. I appreciate the alarms they have, controlled gate access, and the on-site management. I like to know that my items are safe and I've seen the safety precautions prove themselves. Thank you Store More! excellent facility. prices are best around and staff is so helpful. I have had a 10x20 here for over a year now and my experience has been very pleasant. They let me use the rental truck while moving in and saved me at least $100. Times were tough but store more really helped get me through. Thank you!